Ever get a brilliant idea that you’re totally excited about? But maybe you’re too busy to jump on it right away. Then a day or a week or a month down the line you take a look at that idea and it seems different. Instead of getting more excited about it, the idea fills you with dread. The exciting idea is locked in the high tower of a castle and it’s surrounded by a moat. Filling that moat are crocodiles and their teeth are made of all your fears and insecurities. Maybe the idea teeters perilously on a mountaintop and you are standing a mile below it, watching it with binoculars, thinking: “It will take a lot of work to scale that mountain.” Maybe the idea will blow away before you even get there and your climbing will be for naught. Perhaps the idea suddenly seems useless; vestigial, even. What’s the point in pursuing this appendix or wisdom tooth of an idea? Doesn’t everyone feel that way sometimes? Some ideas really aren’t worth the brain cells they’re printed on. But lots of them are worth the effort. So how do I cross the moat? How do I scale the mountain? How do I even get out of the starting gate? Peer pressure sometimes works too. Telling someone really naggy about an idea can light a fire. Your mom and your kids often do a super job of bringing up the hopes and dreams you left for dead. But the real secret to getting past the starting line? Caring about the thing that needs starting. It seems kind of crazy to make a point that you have to care about something to get moving on it but that’s really the key to motivation. Sure, pain and frustration are motivating. Incentives are motivating. But those don’t necessarily have longevity. Giving a rat’s rear-end is pretty much the only way to guarantee a go-getter attitude. How many times have you slogged through an undesirable task that you didn’t care about? At least once, if you’re human. And how likely are you to seek that activity out again? But what about the things that bring us a sense of accomplishment? That we slog through, without complaint, no matter how difficult? Those are things we care about. Duh. But I love my job. Because my job isn’t really teaching people about those subjects. My job is finding an INTERESTING way to teach people about those subjects. I care about my clients and I want to see them be successful. I also love a challenge. That is a powerful duo for motivation. It gets me across the starting line every time. I feel lucky to have ended up in a profession – not to mention a multitude of side projects – that I feel pretty enthusiastic about. Lots of people trudge through life and many are held back from things they’d like to accomplish; due to fear, lack of support, or any number of obstacles. Our culture often tells us to go after the things we are passionate about. I think this is backward thinking. I think we should find what we are passionate about in the things we currently have in our lives. This is what expands our capability for satisfaction and leads us to discoveries we would never have made otherwise. I didn’t choose instructional design & development. It came to me out of years of putting effort and admiration into the facets of other experiences; in fact, it came after 10 years in another profession entirely. But the seeds of passion for my current vocation were tucked away in that other career. I’m not at all a believer in the Law of Attraction, but I do think adopting the mindset of passion for our current circumstances is actually liberating and opens the door for all kinds of motivational magic. 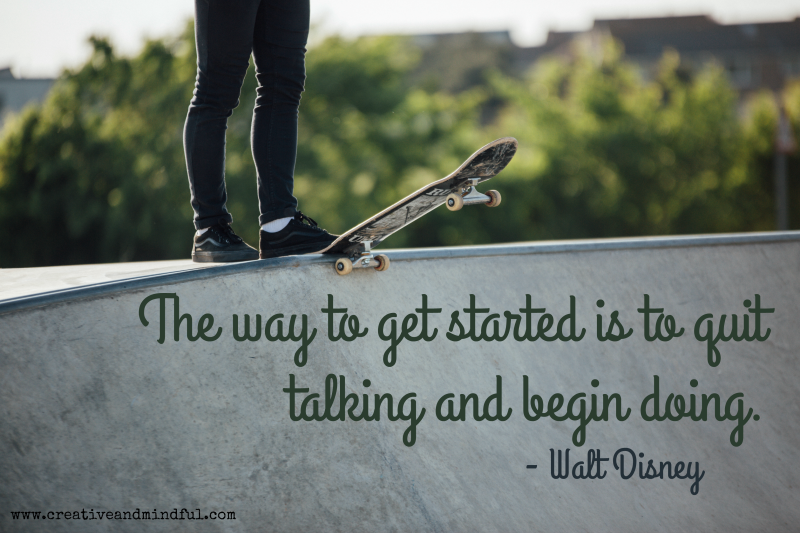 Getting started is just a matter of wanting to. I totally know what you mean when the excitement of the idea dies down and getting started seems so hard. I have a project I want to get started on but just can’t seem to. I’m going to write a list of small things I can do towards the goal. Hopefully that will get me moving! Thanks for your comment, Eileen. I think small, manageable steps can definitely help you get going – they sort of snowball into momentum as you knock them out. Any forward movement is a good thing, in my opinion! Good luck with your project!